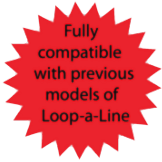 Cable pair tracing and a lot more, Loop-a-Line products can remotely control a far end device (the oscillator) for up to 20km of cable. In a normal situation (without a Loop-a-Line) once a linesman has located a pair at the far end, he cannot make tests because the oscillator or tone sender is still connected at the other end. Thus either another person is needed at the far end, or the linesman has to travel to the far end to remove the oscillator before fault location can commence. Using a Loop-a-Line allows the linesman to remotely change the state of the oscillator to any of five different states. Therefore eliminating the need for multiple journeys along the cable path. 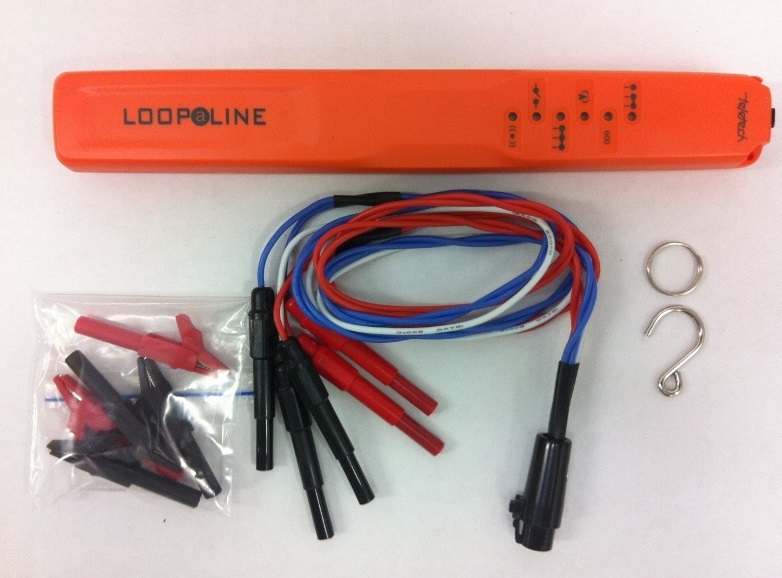 TX916, the new improved Loop-a-Line for efficient telephone installation and repair. For quiet line, the termination is 900 Ω in regions where this is the standard network termination. The new TX916 provides the telecommunications technician with an instrument that cuts repair and installation costs! 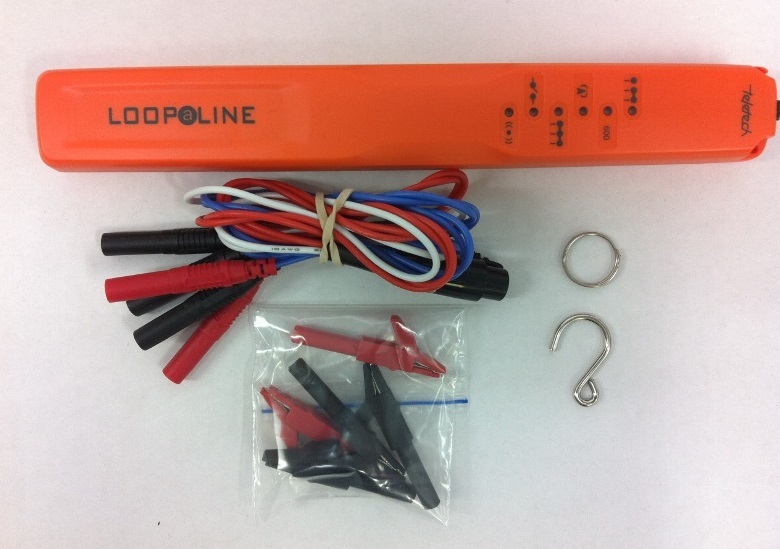 The TX916 Loop a Line kit consists of an Oscillator and a Probe unit and two sets of test leads. A single technician, working alone, can connect the Oscillator to the cable pair at the exchange MDF, street cabinet or distribution point. The Oscillator starts in the ‘TONE’ mode allowing the technician to identify the pair at the Far End of the Line with the Probe. Extra Oscillators can operate on separate pairs of a cable and are identified by the different tones available. Short circuit detection, foreign battery reverse polarity on Blue test leads. Selectable warble (default), continous, two tone beeps repeating and three tone beeps repeating. 900 Ω ohm cable pair termination, conguration for noise measurement. Tone receiver mode automatically powers off after 2 minutes. Max current consumption in tone receiving mode approx. 98mA. TP901 Probe without test lead. Part of the TX916/911 kit. See TX916 kit for full details on functionality. Green/Red LED shows exchange connected. The TS916 oscillator is used as part of the TX916 Loop-a-Line kit. The TS916 oscillator is also fully compatible with previous models of Loop-a-Line. The TX961 is a small hand held instrument that enables the identification of a co-axial cable within a bundle of cables. The TX961 is non-intrusive and does not interrupt data on the cables being traced. The TX961 is ideally suited in tracing co-axial cable within multi-story backbone cabling installations. Typically, the TX961 is used in buildings and exchanges to track and trace co-axial cables. The TX961 consists of a two part kit, an Oscillator and a signalling Probe. The Oscillator TS961 has two LEDs. One LED flashes continuously when the unit is switched on and the other LED glows when the battery is low (low battery indicator). Additionally, the oscillator has a special clamp lead. The removal of the clamp lead from the TS961 automatically turns the instrument off. The TS961 has a very low power usage and a battery will last approximately 200 hours of continuous use. The Probe TP961 has six LEDs. One LED is used to indicate if the unit is switched on. The other five LEDs operate to indicate signal strength. By referring to the LEDs an operator can use the TX961 in noisy environments.